High-performance Women's Elite Power Recovery Compression Tights by 2XU not only look good but have built-in technology to promote increased blood circulation and reduce leg fatigue. 2XU Power Recovery Workout Wear has graduated stamping technology extends down the leg to the ankle and stops at the mid section of the foot. The ankle is cut out to not hinder foot movement to get the most out of this compression garment. The firm 25-30 mmHg compression gives optimal venous return which means faster recovery to sore and fatigued muscles after vigorous physical exertion and training. Improving recovery time is particularly helpful when muscles and joints are overworked and swollen from overused and are susceptible to injury. Choose Power Recovery Compression Tights are made with a fabric that's antibacterial, lightweight, flexible and breathable. 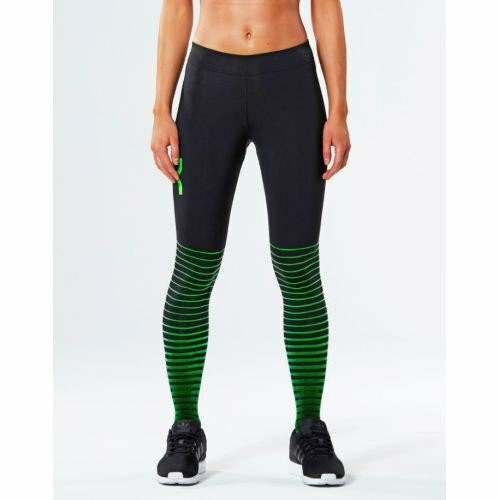 The tights are available in black with green stripes or solid black with nero stripes available in a variety of sizes with tall length options in size small and medium. Use mild detergent and do not use bleach. Hang dry garment, do not place in a heated dryer or it will compromise the integrity of the garment.